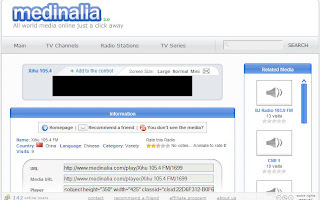 Medinalia is a web 2.0 online media site, that lets you watch online TV, listen to online radio around the world. It has over 1600 Live TV channels, 5200 Live radio stations, 500 TV series, from different countries and different language. It has a nice player for you watch & listen to the program, and it also give you code for your website. It is really cool.